Trump’s idea was to move the league’s schedule from the spring to the fall where it would compete head-to-head against the NFL (even though it was clear that the league was not ready for that move). While successful in the spring, the league’s move to the fall was a “Yuge” failure. Additionally, Trump was – surprise! – everywhere. Making newspaper headlines for his brash comments and kooky plans. Not hacking it on the field, the solution? Litigation! The result? 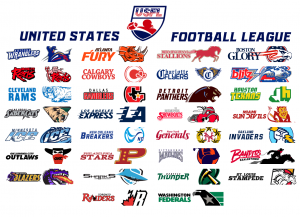 The jury awarded the USFL $1 in damages (yes, that is $1). Trebled (as required under antitrust law), total damages came to $3. Yes, Trump had magically “tripled” the league’s investment in the lawsuit. Needless to say, the USFL folded shortly thereafter. The NFL got an influx of great talent from the disbanded teams, but knew enough to vote “no” to keep Trump out of the ownership club. Trump may not always be the smartest guy in the room or the most successful, but damn he is the most entertaining (and the most orange)! Looks like I have several things to talk about as we are now at the end of the 2015-16 NFL season. First up is the recent Hall of Fame voting and the Class of 2016. No surprise that Brett Favre got in on the first ballot or that Marvin Harrison finally made it. The same for Orlando Pace. The rest of the bunch, with one exception, I just say “Fine. If that’s who you think belongs, good for you.” The one exception: Ken Stabler. It should have been a federal crime to keep Ken “The Snake” Stabler out of the HOF until this year, just after he passed away in 2015. The Snake was “The Man” in the 1970’s, the undisputed leader of the baddest, toughest, winning-est, and weirdest bunch of outcasts in the NFL – the Silver and Black, the Oakland Raiders. 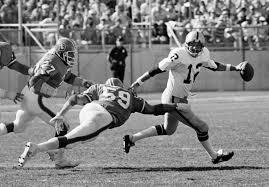 I saw many games where Stabler would somehow, twist and turn and scramble out of a sure sack to hit the long bomb or a crucial touchdown pass. So many times my friends and I would look at each other and say “How the $%k did he do that? !” All Oakland did was win, and then win some more. Hell, even their punter (Ray Guy) was awesome. So, Mr. Stabler finally getting into the Hall of Fame, well after so many lessor candidates were inducted, is well deserved. As for the voters prior to this year – they should be drug out back behind the barn and punched in the kidneys until they admit that they are idiots. With that off my chest, let’s turn to the Super Bowl. It was a good game – one of the more entertaining of the past ten years or so. While I could care less who won, it kept my attention until the very end, something a lot of the Super Bowls fail to do. Was great to see Wade Phillips get his due as a coach and to see Von Miller and Demarcus Ware show up big time. They were beating on Cam Newton like it was their job! On reflection, I guess it was their job. As for the Panthers, hard to believe it was the same team that steamrolled through the NFC playoffs. Cam looked like one of the 17 back-up QB’s the Cowboys used this year. None of the commercials really grabbed my attention other than the monkey/baby/puppy horror served up by Mountain Dew. That was worse than the constipation commercial. I can only imagine that at the meeting where they are firing the numb-nuts who came up with the constipation commercial, his defense is “at least I didn’t come up with monkey/baby/puppy creature!” Halftime was kind of a mess. I though Coldplay was playing. Felt like they got one song in and then two other bands kidnapped the stage. I love Bruno Mars – mega talented. Could live without Beyonce. She writes/performs the same song (and dance) over and over and over. Made me wish for “Up with People”! I guess the days of “all for one and one for all” – a hallmark of why the NFL became the most popular and successful sports league in America – are over. The NFL has a lot of issues on its plate at the moment – popularity isn’t one of them. But at some point, the owners really need to think about what they’re doing and how it impacts interest in the game. They need to make it safer for players, stop the extortion of cities over stadium funding, and give something to the fans other than the finger when it comes to ticket prices/parking/concessions, endless pre-season games, and televised games that are taking longer and longer to play. Not saying the league is in a danger right now, but I think you’re starting to see a few cracks in the foundation. Better shore it up quickly Mr. Goodell. Here comes the NHL!